Fantasy Baseball Podcast: Are Alonso, Matz and the Mets for real? 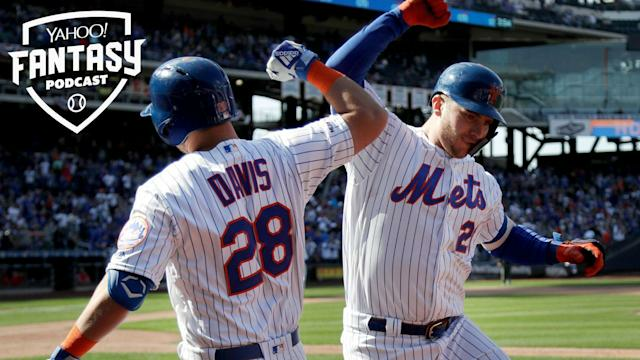 After the 2018 New York Mets got off to a hot start, they cooled into one of the more disappointing teams of last season. Scott Pianowski is joined by D.J. Short of Rotoworld and NBC Sports to discuss the 2019 Mets and if the impressive Aprils out of Pete Alonso and Steven Matz are for real (1:40). They also discuss the Atlanta Braves, Philadelphia Phillies, Washington Nationals and what appears to be a crowded NL East race (6:30). Later they dive into D.J. 's latest Waiver Wired column and discuss some up-and-coming players you might need to fill out the fringes of your roster including Max Fried, Michael Pineda, Jesse Winker, Derek Holland and Alex Gordon (9:15). Next, Scott & D.J. reassess the fantasy value of two former fantasy studs off to very slow starts in Boston's Chris Sale and San Francisco's Buster Posey (25:05). Wrapping up the baseball talk, Scott asks D.J. about some guys who've turned some heads with hot starts in April including Dan Vogelbach, Austin Meadows, Tyler Glasnow, Ian Desmond and Anthony Rendon (31:15). To close out the show, Scott and D.J. get nerdy about music and draft their favorite albums of the last 20 years (40:15). Please remember to rate, review and subscribe on your podcast provider of choice and send us your questions for future episodes on Twitter @YahooFantasy.